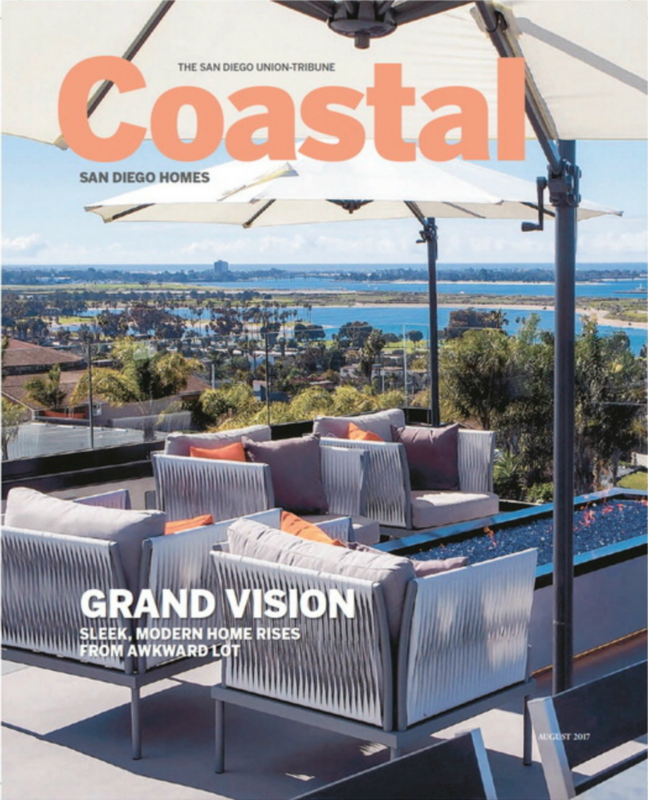 Anna Rodé Designs was recently featured in an article, Sanctaury Style, in the San Diego Union Tribune’s Coastal Home edition for August 2017. Coleen Choisser, owner of Anna Rodé Designs, was interviewed for the piece and shared her expertise on transforming the master bedroom of any home into a santuary space that is uniquely your own. Read the article below. Unlike any other room in the house, the bedroom is all yours. Compared with priorities for the kitchen or living room, choices for the bedroom are uniquely personal. We asked Coleen Choisser, certified interior designer and owner of Anna RodDesigns, about updating the bedroom. Q: What are some popular styles this year in bedrooms? 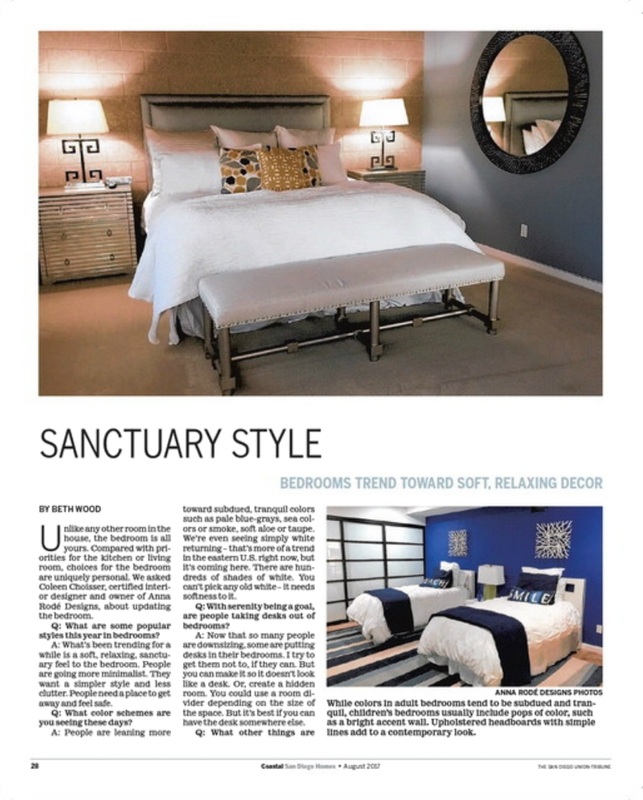 A: What’s been trending for a while is a soft, relaxing, sanctuary feel to the bedroom. People are going more minimalist. They want a simpler style and less clutter. People need a place to get away and feel safe. Q: What color schemes are you seeing these days? A: People are leaning more toward subdued, tranquil colors such as pale blue-grays, sea colors or smoke, soft aloe or taupe. We’re even seeing simply white returning – that’s more of a trend in the eastern U.S. right now, but it’s coming here. There are hundreds of shades of white. You can’t pick any old white – it needs softness to it. Q: With serenity being a goal, are people taking desks out of bedrooms? A: Now that so many people are downsizing, some are putting desks in their bedrooms. I try to get them not to, if they can. But you can make it so it doesn’t look like a desk. Or, create a hidden room. You could use a room divider depending on the size of the space. But it’s best if you can have the desk somewhere else. Q: What other things are people choosing for the bedroom? A: Wallpaper is coming back strong, especially in heavy textures. I’m getting calls for farmhouse style, shiplap siding. It gives a modern farmhouse look with reclaimed wood. We’re also doing stereos and music surround- sound in the bedroom. Color on the ceilings is coming in again. White ceilings are pretty much out; people are choosing soft colors on the ceiling. One popular color here is pale blue-gray on the ceiling, like the San Diego sky. It looks like a skylight, but very soft – not like in Las Vegas. Q: For so long, carpets were a given in the bedroom. Is that still the case? A: Even in the bedroom, we are doing wood flooring. In Southern California, people are so into their pets. People seem to have more allergies now, and wood or hard surfaces are better for that. Accent the room with area rugs to give you the softness underneath your feet. You can replace an area rug as long as it’s inexpensive. If the dog ruins one of those, it’s not a big deal. Change the paint, put down new area rugs and you have a whole new look. That makes for a quick, easy remodel. Q: Isn’t wood flooring expensive? A: Real wood flooring is expensive – and if you have a flood, or roof leak, it’ll ruin your floor – but not vinyl-wood planking, which is affordable. It looks so real no one can tell the difference. 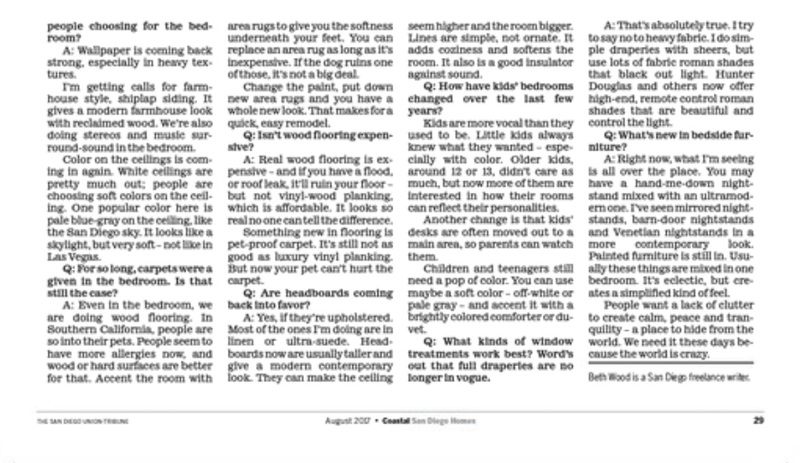 Something new in flooring is pet-proof carpet. It’s still not as good as luxury vinyl planking. But now your pet can’t hurt the carpet. Q: Are headboards coming back into favor? A: Yes, if they’re upholstered. Most of the ones I’m doing are in linen or ultra-suede. Headboards now are usually taller and give a modern contemporary look. They can make the ceiling seem higher and the room bigger. Lines are simple, not ornate. It adds coziness and softens the room. It also is a good insulator against sound. Q: How have kids’ bedrooms changed over the last few years? Kids are more vocal than they used to be. Little kids always knew what they wanted – especially with color. Older kids, around 12 or 13, didn’t care as much, but now more of them are interested in how their rooms can reflect their personalities. Another change is that kids’ desks are often moved out to a main area, so parents can watch them. Children and teenagers still need a pop of color. You can use maybe a soft color – off-white or pale gray – and accent it with a brightly colored comforter or duvet. Q: What kinds of window treatments work best? Word’s out that full draperies are no longer in vogue. A: That’s absolutely true. I try to say no to heavy fabric. I do simple draperies with sheers, but use lots of fabric roman shades that black out light. Hunter Douglas and others now offer high-end, remote control roman shades that are beautiful and control the light. Q: What’s new in bedside furniture? A: Right now, what I’m seeing is all over the place. You may have a hand-me-down nightstand mixed with an ultramodern one. I’ve seen mirrored nightstands, barn-door nightstands and Venetian nightstands in a more contemporary look. Painted furniture is still in. Usually these things are mixed in one bedroom. It’s eclectic, but creates a simplified kind of feel. People want a lack of clutter to create calm, peace and tranquility – a place to hide from the world. We need it these days because the world is crazy.